Using a new tool in the Molecular Imaging Laboratory (MIL), researchers can study in real time how cholesterol affects tumor progression in breast cancer. You probably are aware that high blood cholesterol levels can cause problems in your arteries, leading to heart disease, a heart attack, or a stroke. But are you aware of other effects of cholesterol, including impact on tumor progression in certain cancers? 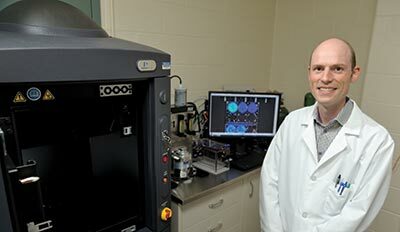 Using a new tool in the Molecular Imaging Laboratory (MIL), Erik Nelson, assistant professor of molecular and integrative physiology, studies how cholesterol affects tumor progression in breast cancer. The MIL, part of the Biomedical Imaging Center at Beckman, recently acquired a PerkinElmer IVIS Spectrum CT live-animal imaging system. Collective cross-campus contributions from the Office of the Vice-Chancellor for Research, Beckman Institute, several colleges, departments and individual principal investigators made the purchase possible. The IVIS system is the only in vivo small animal dedicated imaging system on the market that supports both 3D optical and x-ray computed tomography (CT), which allows for both functional and anatomical imaging. Nelson is looking at how statins, drugs that limit the production of cholesterol such as Lipitor or Crestor, can be used as either a treatment or to prevent cancer metastasis. His study is funded by the National Cancer Institute. IVIS allows the researchers to examine the cells as they grow and spread. Using the CT scanner on top of the IVIS scan provides for a 3D image, which can give more detail as to the exact location of the cancer cells. “For a lot of my work, we’re looking at metastasis to the bone, so we can see exactly if these cancer cells are on top or inside the bone,” said Nelson. The IVIS system complements other non-invasive in vivo imaging tools within MIL such as positron emission tomography (PET) and single photon emission computed tomography (SPECT) scanners.